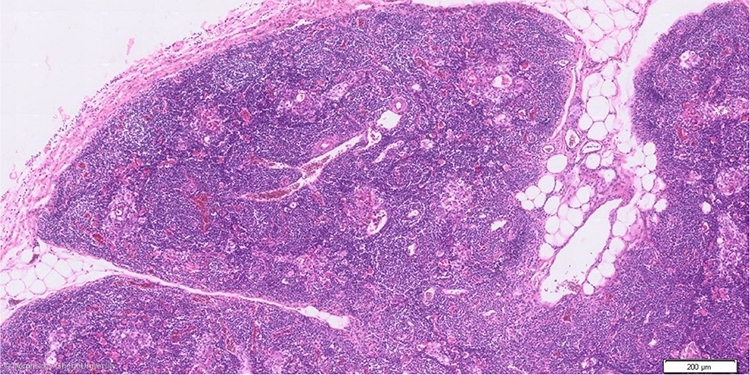 the thymus is embedded in loose connective tissue and adipose tissue. Each lobe is enclosed by a thin connective tissue capsule (capsula thymica). Small trabecules (trabeculae thymicae) divide each lobe in incompletely separated lobules. The lobules (lobuli thymici) consist of two regions: the cortex and the medulla. In chickens, a clear distinction between cortex and medulla disappears with aging. On the micrograph above, distinction between cortex and medulla can hardly be seen.